for drying (leather britches), grape juice, peaches, salsa, and vegetable soup. One of my favorite things about Appalachia is the FOOD. Most southerners equate food for love. I've been a foodie long before that was ever a term and you can tell by looking at me that I am well loved. Ahem. We tend to show up with a casserole dish for every kind of occasion: births, baptisms, graduations, reunions, engagements, weddings and even deaths. The story of how we obtain and prepare food, like most of Appalachian culture, is a saga of change. The region has evolved from simple self-sufficiency to more of a Wal-Mart, Ingles, fast food culture. "Traditional food and cooking in the Appalachian highlands have a strong association with self-sufficiency and hard times. Families in isolated areas were obliged to grow most of what they ate, buying only those products they could not raise, such as coffee and baking soda. Before the advent of food preservation technologies such as canning and freezing, mountaineers had to depend on root cellars or trenches for storing potatoes and cabbage, and the diet in winter could become seriously deficient in vegetables and fruits, leading in the worst cases to scurvy and other nutrient-deficiency diseases." When my Granny was my age, the majority of women she knew canned vegetables, fruits, jellies, etc. I only know a handful of people my age who do. The most common reasons are the lack of time and the belief that it's cheaper just to buy it at the grocery store. I assure you that your time invested will not be in vain and in this case, as in most, cheaper is not better. There is nothing better than opening and cooking a jar of home canned green beans, or anything really, on a cold winter day. It's like a spoonful of summer right there on your plate. Of all the things that make up our cultural identities, people seem to cling to food the most. I have recently been more interested in learning to cook and preserve food the way my family has for dozens of years. This summer, I have canned more food from our family garden than I have in the past 16 years that I've been married. It is a lot of work but so rewarding to see those jars fill up and know that my family will eat well after the garden has withered away. 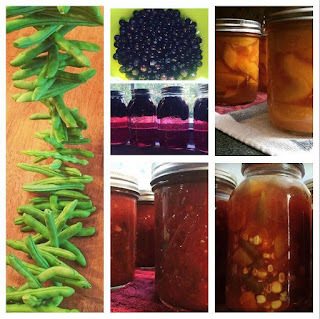 Do you or anyone you know enjoy canning? What kind of things to you put up for the winter? I look forward to sharing some of the recipes and methods that I've learned this summer!